Left to right: Finepoint MD Giles Bendig celebrates the Polycom Video Endpoints Sales Certification with Pro-AV Sales Manager Paul MacKenzie. 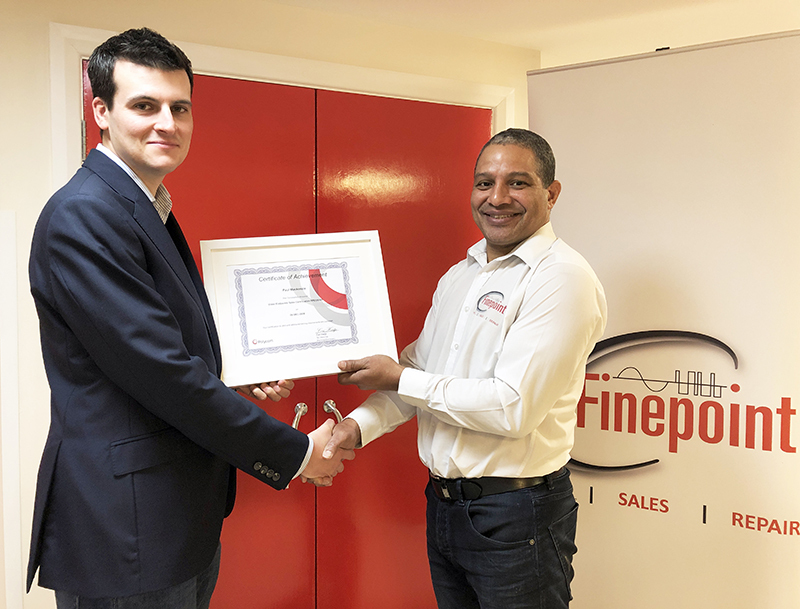 January 31st 2019 – Finepoint AV Division is pleased to announce the award of Polycom Video Endpoints Sales Certification to its Pro-AV Sales Manager, Paul MacKenzie. "This is a milestone development which affirms our commitment to Polycom as a major supplier to the unified communications and collaboration market which the company's very wide range of products address," comments Finepoint Managing Director Giles Bendig. "With over 20 years of experience in the video communication business, Paul is ideally positioned to expand our services and capabilities. This is only the beginning of our AV investment strategy. Working in partnership with leading suppliers such as Polycom will enable us to accommodate clients requiring complex collaboration environments." "We like working with well established brands and introducing our clients to innovative technology solutions," Paul MacKenzie adds. "Founded nearly 30 years ago, Polycom has become one of the most respected players in the video communication sector. Having recently been acquired by Plantronics, it will have greater R&D investment to expand into the huddle-space market with the development of the new Polycom Studio product line." "Our role is to apply such technology in practical, efficient and open solutions that our clients can appreciate for their existing meeting room and conferencing room environments without having to undo the infrastructure they are currently running to support their IT needs. AV and IT are now closely integrated so we use IP networks regularly to manage support and run the AV and video solutions we deploy for our customers. Polycom is a good long-term fit for our business as a supplier." Finepoint (www.finepoint.co.uk) operates in the UK from headquarters in Kingswood, Surrey, and a sales office at Pinewood Studios. A business with over 35 years of experience in its field, the company is well positioned to provide and install sophisticated AV equipment while still retaining a personal touch and high service level.